I’m not quite sure I have professed my LOVE of apples and apple picking to the full extent yet. I’m pretty sure this will cover it though. My love of apple picking goes back to my childhood when I first went apple picking with my best friend and her family. I loved the fact that I could climb the trees and not get in trouble for doing it. I was a complete tomboy. Apple picking came early this year in NY and for some local farms it didn’t even happen. I took full advantage of taking Riley twice to go apple picking. The first time we made our mini apple pies with our apples. This time I wanted to combine my love apple pie with cupcakes and a little caramel on top for good luck. Love this! A great way to add flavor to a cupcake! I was fortunate enough to be one of the teachers who got to sample this. OH MY WORD! They are delicious. So glad the recipe is here. Amazing. Oh….my…gosh. Those look amazing!! Thanks so much for sharing the recipe! I will have to try them out! Ok, I must admit that I had previously pinned this recipe because I must make them and soon. So glad you shared it on Saturday Sharefest! Any specific type of apple you recommend? What did you do with the cupcake middle you scooped out? Snack? 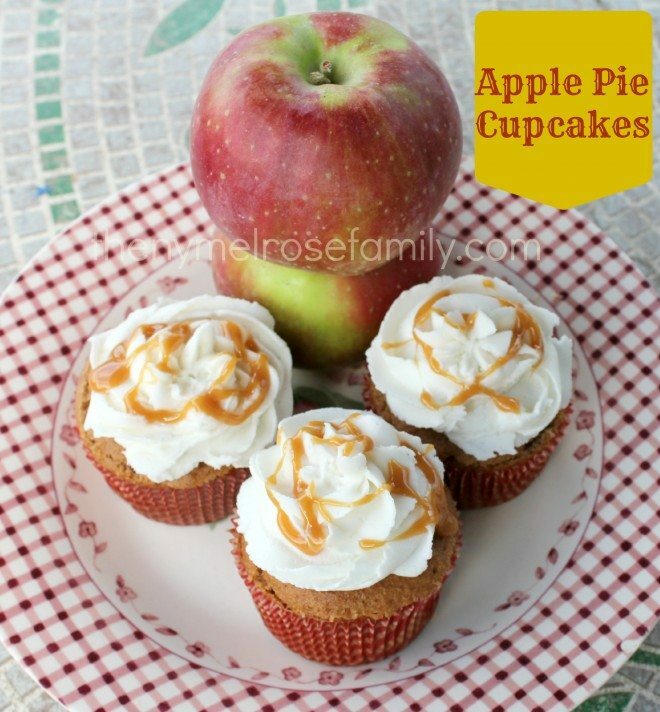 That’s such a clever (and delicious idea), apple pie filling in a cupcake!! What a great idea! They look like heaven in a cupcake wrapper. 🙂 There’s nothing like picking your own apples, too! They taste so much better than store bought apples. I was literally just watching an old Cupcake Wars episode and someone made an apple pie cupcake that they filled with an apple filling. I was thinking they sounded so good. Then, I found your recipe! Perfect timing. Yum! Oh I’m going to make these for Thanksgiving. They look so delicious, I’m fighting the urge not to lick the screen lol. I hope your having a great Monday. This looks delicious and perfect for this Fall! New follower from Your Creative Timeout Linky Party! These look so yummy! Stop by House on the Way tomorrow to see them featured! Grab a “House Featured” button too! YUM!!! these look AMAZING!!! I’m jealous that you’ve been doing all this fun stuff. I’ve been laid up in bed so sick I can barely move. Hopefully I start to feel better soon! I hope you do too. I’m so excited for you though. Girls you’ll get that same feeling you probably did when you were going on the prom. if it. You’ve been fighting your work for some time now. so are willing to fight to achieve everything you propose. bucks on an initial reading is just not in the cards.